Feel better about knocking back a few shots by getting some of your daily allowance of fruits and veggies at the same time. 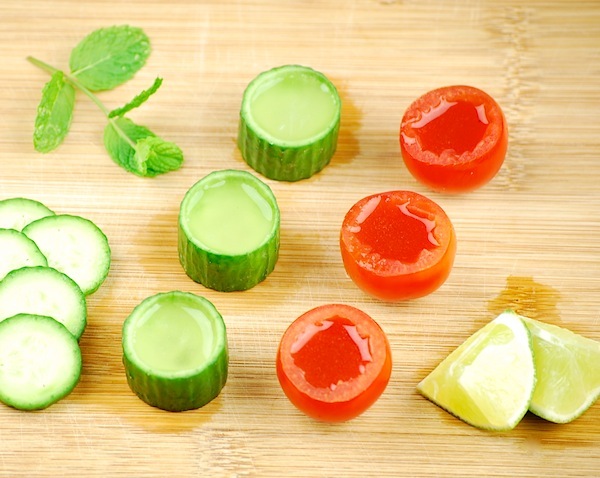 Try these edible shot glasses with your favorite cocktails inside. Everything is more fun in miniature, even when it comes to these cocktails. These mini cocktail shooters, served in edible shot glasses made of fruits and vegetables, are a fun party idea that won’t leave your guests in need of a cab. Take a sip or pop the whole thing in your mouth. Cut watermelon off the rind and place in a martini shaker with lime. Muddle well. Add tequila, triple sec and sweet and sour mix. Shake with ice. Strain into a measuring cup and pour into watermelon shot glasses. 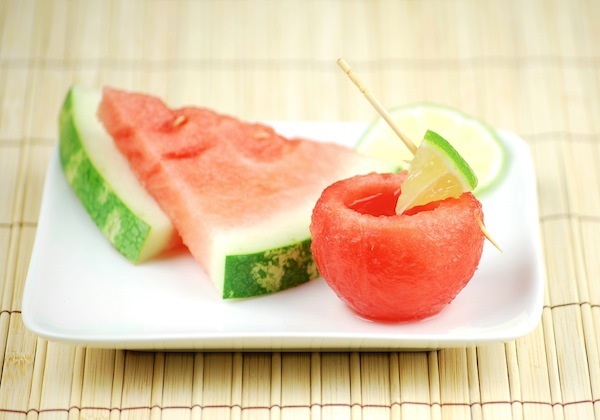 To make watermelon shot glasses, scoop out watermelon balls with a 1-1/2-inch ice cream scooper. Cut a small slice off the bottom. Use a melon baller to scoop the insides out from the top, being careful not to puncture. Mix vodka, bloody mary mix, squeeze of lime and horseradish over ice. Strain into a measuring cup and pour into tomato shot glasses. To make tomato shot glasses, cut the top off cherry tomatoes. Using a small paring knife, cut around the inside of the tomato and scoop out seeds and flesh, being careful not to puncture. Place lime, mint leaves and chopped cucumber in a martini shaker. Muddle well. Add vodka and sweet and sour mix. Shake with ice. Strain into a measuring cup and pour into cucumber shot glasses. To make cucumber shot glasses, cut 3/4-inch lengths of cucumber. Using a melon baller, scoop out insides, leaving the bottom intact.